According to the Facebook post accompanying the video, the uploader claims that while he was there first and was waiting to park his car, the woman in the video walked up and stood over the parking spot to "reserve" it for her friends. In the video, which is slightly less than two-minute long, the woman can be heard telling the driver that he has "no manners", to which he replies, saying, "No manners? Then what about you? You stand over here. You're not a car. You're a person." 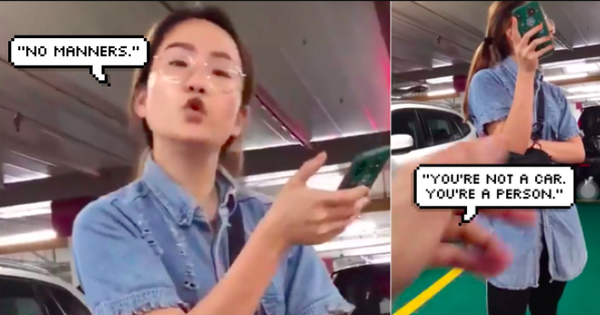 The driver, who filmed the video, can be heard telling the woman that on one hand she talks about manners and on other she takes a swipe at him for not speaking in Chinese. She then continues to stand there, while holding her mobile close to her face. The woman eventually walks away and gets into her friend's car. However, not before she once again throws insults at him in Mandarin. At the time of writing this story, the video was shared across Facebook more than 12k times with thousands of comments and over 500k views. Several comments pointed out how standing in parking spaces is a crime under the Road Transport Act.